We usually don’t post many press releases on the site. Reason being is everyone else does and I’m sure you guys don’t like to read the same article over and over. But in the case of Mbombay we couldn’t think of a better way to introduce our newest site sponsor and thank them for the support. 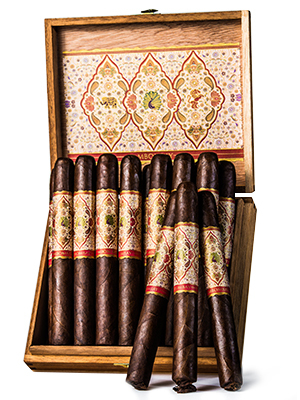 A truly boutique cigar, MBombay, just hit the shelves of retailers in Southern California within last couple of weeks. MBombay Cigars are made in a very small factory in San Jose, Costa Rica. The owner, Mel Shah, is a Palm Springs based tobacconist and a wine retailer for last 15 years, commented on the line “… our philosophy is simple, acquire the best quality of tobaccos and focus on quality than quantity. The wrapper tobacco used for our classic line is Ecuadorian Connecticut Shade from 2001, binders and fillers are well aged from 2006 and 2007. After the cigars are rolled by only four to five rollers in the factory, the cigars are kept in the “caparate” for more than 6 to 7 months before we start to import to the United States.” With production of merely 1000 boxes a month (boxes of 20), Shah does not plan to distribute the line to more than 200 to 250 stores nationwide. The Classic line is available in five sizes: Corona (5″ x 43), Robusto (4.5″ x 48), Belisoco (5″ x 52), Perfecto (a figurado 6 x 50) and Churchill (7″ x 48). The retail price ranges from $8.50 to $11.50. The Maduro line is available in four sizes: Robusto (4.5″ x 48), Perfecto (a figurado 6 x 50), Churchill (7″ x 48) and a Double Corona (7″ x 52). The retail price ranges from $10.00 to $13.50. years ago. The factory has an outstanding record in making cigars like Atabe, Byran and few other highly rated and popular names in European market.” For the time being, Mel does the marketing of cigars himself and with couple of his friends in the cigar industry, and visits the retail stores he feels that can house and support his cigars. “It is not easy to sell cigars in the market, nowadays. Retailers want to understand and I want to make sure that my cigars don’t end up as a dead stock on our retailer’s shelves. I’ve gone through some horrifying experiences with a few brands in our store too, and I do not want any of our retailers’ to go through that with MBombay” Shah added. 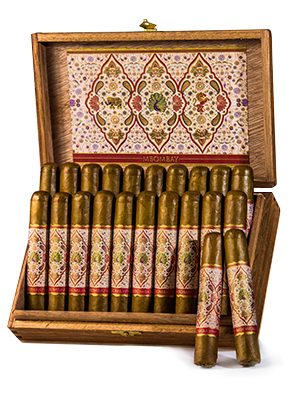 MBombay cigars are distributed solely by Bombay Tobak. Contact them through their website http://www.bombaytobak.com for more information. I’m intrigued. Mata Fina maduro wrapper and Peruvian binder? Wow. I love that tangy/sweet dried fruit component that the Peruvian tobacco brings. OK, so maybe not quite so intrigued by the price, but I guess that’s the way things go there days. I would still like to try these. I wonder if they are expanding their retail network to the Northwest? The blend sounds FANTASTIC. The cigars look even better. I know I’ll be trying to chase a few down for sure. I wonder if they will do mail order? Hi there, I am the Director of Marketing & Public Relations for MBombay Cigars. If you check out our webpage, we have a list of Fine Retailers in Southern California that would likely ship out to you. Please contact them for assistance in obtaining cigars. We are currently expanding and will be in your Region in the near future. THANK YOU for your comments! Beautiful! Exactly what I was looking for. Thanks a ton. Can’t wait to get my hands on them.